D Cordón Benito, L Maestro Espínola (2017): “Museums’ corporate websites as tools for transparency”. Revista Latina de Comunicación Social, 72, pp. 941 to 956. Introduction. The environment in which organisations operate has changed dramatically in recent years. Cases of corruption, unethical practices and the economic crisis have led to a new complex landscape in which institutions must rebuild the lost trust. The objective of this work is to demonstrate how museums are committed to transparency to showcase themselves as reliable organisations that fulfil their social purpose. Methods. This study is based on the content analysis of the websites of a sample of museums in order to determine whether these channels meet the transparency requirements proposed by the report of the Commitment and Transparency Foundation. Results and conclusions. Like other types of organisations, museums use their corporate websites as transparent platforms, where they meet a series of criteria that increase the public’s trust and provide information of interest to society. Transparency; museums; corporate communication; new complexity; trust. 1. Introduction. 1.1. Transparency: a tool to make institutions stand out. 1.2. The museum: an institution that uses transparency to achieve greater proximity to the public. 2. Research objectives and methods. 3. Results. 4. Conclusions. 5. Notes. 6. References. In recent years, the ups and downs in the political, economic and social environments have led to the transformation of the reality in which institutions operate. Access to information has been multiplied by the Internet and this medium has changed the way in which people communicate with each other. The deep economic crisis, added to the public dissatisfaction provoked by cases of corruption have fostered the loss of confidence in institutions by their stakeholders (Laporte and Gutiérrez, 2013: 9). All this has made the public sick and tired, which has been reflected in numerous citizen movements around the world, such as the 15M or the protests of Venezuelan students against President Maduro. Ultimately, it has been shown that civil society can get organised to actively demand their rights and influence public policies (Derville, 2005). The latest reports issued by the Edelman Trust Barometer (2016, 2017) show that the vast majority of the population does not trust institutions, be they NGOs, governments, private organisations or the media. Both documents encourage organisations to rebuild society’s trust in them by undertaking specific actions and plans. Confidence is an intangible good that will help these organisations to stand out in the face of competition and, given the global market in which all institutions compete today, the benefits of this opportunity are great. In recent years, and in view of the different events that have taken place since the end of the 20th century, organisations have begun to carry out a readjustment to the environments in which they operate, by making their performance distinguishable in a globalised environment (Siriamesh, 2010). The Internet has changed the way in which society interacts and communicates with each other, offering a greater plurality of opinions (Castello et al., 2013). This fact has complicated communication management in organisations, which must compete in an increasingly saturated information market (Freeman, 1984; Cortina, 2003). Institutions have understood that in view of this new social landscape that has made a dent on their reputation, they have to readjust themselves to deal with an environment which expects them to be not only political agents, but also social and political players (Scherer et al. 2014). This context highlights the importance intangibles have acquired in recent years among organisations that wish to meet the expectations of their stakeholders to regain the lost confidence and legitimacy. This has given way to the emergence of a new management model that is based on sustainable growth and focuses on good governance and the creation of value for companies. It is what some authors like Alloza (2011) have called “reputation economy”. Reputation, corporate citizenship and corporate social responsibility become protagonist elements within the new form of management in organisations. The objective is a common good economy that generates shared value that can benefit both the institution and the different stakeholders. Therefore, and as Freeman et al. (2010) explain, companies integrate the interests of their stakeholders with the interests and objectives established by the institutions, achieving a very beneficial level of public confidence. As stated by Alloza (2011), relations with stakeholders can destroy and create value, which has a positive impact on reputation and acts as a key differentiator with respect to the competition. In the case of Spain, where the loss of confidence in institutions for the abovementioned reasons has been reported in the media and through citizen protests, the national government decided to take a series of measures to force organisations to comply with minimum standards of transparency and urged institutions to regain the lost credibility. The Spanish Prime Minister took several steps in this regard: firstly, he enacted the 2013 Law on Transparency, Access to Public Information and Good Governance. Secondly, he established, in Title III of this Law, the creation of the Council for Transparency and Good Governance. And, finally, at the end of 2014, he promoted the creation of the Transparency Website (Portal de la Transparencia). These decisions have benefited citizens’ access to the open data that public institutions decide to put at the service of society and which contributes to the improvement of the perception of organisations by citizens (Gértrudix et al., 2016). As stated in its preamble, the 2012 Transparency Law has a triple objective: “It increases and strengthens transparency in public activities (...), recognises and guarantees access to information (...) and lays down the good governance obligations that must be met by public authorities as well as the legal consequences of non-compliance”. With this declaration of intent, the law aims to respond to the demands of several increasingly critical stakeholders who, in recent years, have requested greater involvement in the public powers. To carry out this work, the Law establishes the creation and regulation of the Council for Transparency and Good Governance which was born as: “an independent body with power to promote the culture of transparency in the activities of the public administration, to control the fulfilment of the obligations of active advertising, as well as the right of access to public information and compliance with the provisions of good governance”. Finally, as stated in Article 5 of this law, the public administrations regulated by this law must regularly publish the information deemed relevant to ensure full transparency in their actions. To do this, the Spanish Government decided to create the Transparency Website , where any citizen can consult or request public information of interest. This way public institutions can easily meet their duties to reasonable explain to society the decisions they have taken and provide stakeholders with data for consultation (Arenilla, 2011; La Rosa et al., 2016; Beltrán et al., 2016). Following the Spanish Government’s decision to make data available, and leaving aside those experts who argue that the Law on Transparency is not as exhaustive as it should be (Lizcano, 2013; Magallon, 2013; La Rosa et al., 2016), the truth is that this Law has had a direct impact on public institutions. Many researchers have addressed the needs for, and implementation and evaluation of transparency by different administrations (Woo Yoo and Gil de Zúñiga, 2014; Beltrán et al., 2016; Cabezuelo et al. 2016; Rebolledo et al., 2016; Carey, 2017). However, and despite the interest generated by this commitment to transparency among public administrations, the truth is that organisations unrelated to the world of politics are also making an effort to show themselves as open entities to stakeholders, to provide relevant information and regain the lost trust. In recent years, there have been several studies on transparency in organisations unrelated to politics (Craig et al., 2016; López et al., 2017; Karlson et al., 2017; Suárez-Villegas et al., 2017). Following this interest in research on transparency and its management by organisations outside the public sector, this article focuses on the world of museums. These century-old institutions have adapted to a changing environment over the years and have shown interest to demonstrate, where appropriate, that they can also bet on transparency as a differentiating tool that has a positive impact on their reputation (Villafañe, 2004, 2013; Huang, 2015). As far as museums are concerned, the truth is that their proximity to the public is a reality. With the arrival of new museology, these organisations have shifted their focus from collections to visitors (Arias-Serrano, 2015). The reasons are diverse and range from their changing nature, which has been made clear by their adaptation to the changes that have occurred ever since their birth, in the midst of the French Revolution; including their redefinition towards dialogic spaces and virtual and physical meeting points with their communities (Black, 2012; De la Iglesia et al. ; Cordón et al., 2016), up to their own definition. With regards to this last point, the fact is that the last definition of museum offered by the International Council of Museums (ICOM)  in 2007 points out that: “A museum is a non-profit, permanent institution in the service of society and its development, open to the public, which acquires, conserves, researches, communicates and exhibits the tangible and intangible heritage of humanity and its environment for the purposes of education, study and enjoyment.” Therefore, this contribution shows that a museum, intrinsically, is an organisation open to society, with objectives focused on it and that, therefore, needs to establish and maintain trust and mutually beneficial relationships with its stakeholders. For this reason, museums are committed to use communication as a management tool that affects the confidence of stakeholders and the reputation of the organisation (Cornelissen, 2004; Doorley et al., 2007). The hypothesis that guides this study is that museums, as institutions with a strong social character, have decided to restore the lost confidence by showing themselves as transparent entities through their corporate websites. While some authors promote conceptions of museums as obsolete and elitist organisations (Hooper-Greenhill, 1989, 1992, 2000; Bennett, 1996), the truth is that they are institutions adaptable to the changes occurring in their surrounding environment. Several objectives derive from this hypothesis: first, to analyse the importance that museums give to transparency; second, to analyse the use of corporate websites to publish relevant information to the public and, thirdly, to establish whether there is a relationship between the transparency offered by museums through their websites and the number of visitors they receive. Taking into account the aforementioned hypothesis and objectives, this research is based on the content analysis of the websites of the most visited museums in Spain, the USA, England and France to measure their transparency. The choice of these countries is justified by the amount of people who visit these organisations to watch their exhibitions. As noted in the introduction, these institutions seek to maintain and improve their reputation ratings through their communication strategies. The website is a tool for the corporate communication of any organisation. For this reason, the article tries to show that the most visited museums in the world develop transparent corporate websites. During the documentation period, we identified the international publication of greater reference for the art and museum sector, The Art Newspaper, which is published monthly by Umberto Allemandi & Co. Since 1996, this publication publishes their annual study titled Visitor Figures: Exhibition & Museum Attendance Survey , which presents and examines the most visited museums in the past 12 months and the most popular exhibitions based on the number of visitors around the world. Due to the inability to find other studies with the same tradition that include the volume of visits to different international museums, we decided to take this publication’s survey as the basis for the selection of the sample of museums. The selection of units of analysis is not random, and includes museums from France, Great Britain, the USA and Spain that registered the largest number of visitors in the last ten years. The first three museums always lead the ranking of most visited museums in the world and, in the case of the Spanish museum, its location in the list ranges from the tenth to the twelfth position in the ten-year period. However, it holds the distinction of being Spain’s most visited art centre. Its inclusion in the sample is justified given the interest of this article in establishing a comparison and extract results of interest. Bearing that in mind, the study analyses the corporate websites of the following museums: Louvre Museum (Paris), British Museum (London), Metropolitan Museum of Art (New York) and Museo Nacional Centro de Arte -MNCARS. Source: Authors’ own creation based on data taken from The Art Newspaper. 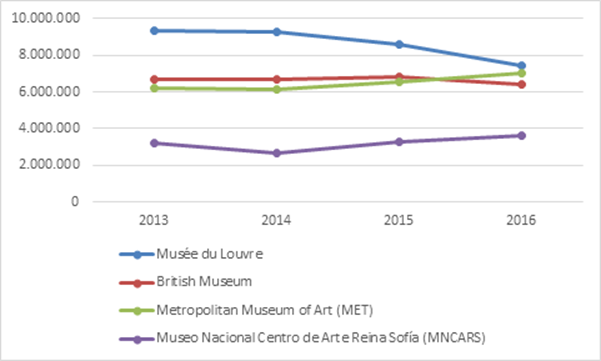 Before detailing the work performed, it is important to show the evolution of the visitor numbers of the sample of four museums that are analysed from 2013 to 2016. The content analysis took into account the categories and indicators designed and employed by the report on transparency in the websites of Spanish museums issued by the Commitment and Transparency Foundation . In this report, the foundation analyses the transparency of the websites of the Spanish museums based on the information offered in such sites. The first report was published in 2010 and has been followed by updated editions that measure the degree of improvement or worsening of the information published on these websites. The nine categories measured are: mission, strategy, activities, acts of disposal, organisational structure, policies, government body, economic information and evaluation of results. These categories are divided into twenty-four items that facilitate the evaluation of transparency of the museums based on the relevant information they make public in their corporate website. The analysis of the content of the institutional websites took place between 26 April and 3 May 2017. Systematically, a template was established to verify that the previously listed categories were met or not in each one of the museums that make up the sample. The following results were extracted from the decoding of the obtained data. The results are structured according to the parameters analysed in the different websites of the museums that make up the sample. All analysed museums have a corporate section within their web architecture that allows users to find relevant information about their history, structure, reports, among other relevant information. In all cases examined in this article, the institutions explicitly state their mission. While it is true that many of them adhere to the definition of museum proposed by the ICOM, their definitions differ from each other, and are adapted to the particular circumstances and idiosyncrasies of their organisations. With regards to the publication of the strategic plan, not all centres have a specific document that details their main strategies for a given period of time. In the case of the British Museum and Museo Nacional Centro de Arte (MNCARS), they have a plan that formulates the strategy for the future. In the case of the British Museum, the document is named Towards 2020: The British Museum’s Strategy, and can be found in the “Management and Governance” section of the website. In the case of the MNCARS the plan is named “General Action Plan 2014-2017”, and can be found in the “Mission” section of the website. The MET does not have a specific document, but its annual report refers to the nuclear values of the organisation and its strategic objectives for the next five years. The Louvre, on the other hand, does not make its strategic plan public on the website, although it does shares its specific strategy of social responsibility for the 2015-2017 period. In relation to the websites’ publication of the activities of the museums, the question is divided in two parts for a better structuring of the results. First, we investigated the inclusion of the description of the main activities of the centres, emphasising documentation, curation, research and dissemination. In all cases, their websites have sections with information related to these four main activities, being the most common documentation and dissemination, understanding the latter as the communication developed by these organisations’ press departments. Second, the analysis focused on the sections that contained information about the educational activities developed in these centres and their target audiences. The truth is that all the museums’ websites have a space devoted to education, which highlights all educational programmes designed by the museum and their target stakeholders. An interesting example is provided by the Museum MNCARS, which publishes on its site a document called Educational Programme: Full programme, in a downloadable PDF format. In addition, the website version offers the possibility to filter these activities by type of audience: school-age publics (with their corresponding educational levels), children (families and children's activities), young people (with different age groups), adults (with different types) and accessibility (which can be filtered by type of difficulty affecting the visitor). Another variable of analysis is related to acts of disposition of the collections, i.e., whether the website offers information about acquisitions, loans, transfers, deposits, or purchases. Specific information about this type of data is not published in three of the four museums. The websites do share information about the history of the Museum and its collection, but there is no specific mention of what kind of works are owned by the institution and which are transfers, loans, etc. However, it should be noted that, despite not offering this information in a specific section of the website, this information can be found in the annual reports, which explain all of these points. The only Museum which offers this information in a specific section of its website is the British Museum, which contains the microsite named “Annual Reports and Accounts”. The analysis of the organisational structure indicates that there are differences in the publication of the names and surnames of managers and artistic directors; the name and surname of the head of departments and the emergence of an organisation chart explaining the departmental structure. The cases under study do share the name and surname of the director or manager of the institution, which is information of reference when it comes to meet the head of any organisation. This is not the case with the full name of the people responsible for the various departments that make up the museums, given that two of the four museums do not share this information or only publish the contact details through a generic email address. The only museums that do make this information public are the British Museum and the Queen Sofía Museum, in the sections “Freedom of Information Publication Scheme” and “Team”, respectively. The websites offer the names and surnames, as well as the position of the museum’s team members and, in the case of the British Museum, this information is accompanied with a short biography, the email and the contact information of the heads of department. Finally, two of the four analysed museums make reference to their organisation chart: Musée du Louvre and Queen Sofía Museum. Unfortunately, the first of these institutions offers a link with technical problems that prevent users from reaching this information. Thus, the only valid organisational chart is the one provided by the Spanish museum, whose website provides visitors with the structure and organisation of the different areas and departments of this art centre. This helps users to better understand the organisation of the institution and the interdependence of the areas. The analysis of the rules governing the operation of each of these centres, as well as the policies guiding their different areas, provided very homogeneous results. The websites of the four museums have a section that mentions the various laws that regulate their general performance and the specific operation of their areas (acquisitions, transfers, conservation, etc.). In the case of the MET, this information is published in a section named “Policies and Documents”; in the British Museum, this documentation can be found in the section named “Management and Governance”, which includes 22 regulations in this regard; the Louvre offers this legislation in a section named “Documents juridiques et marchés publics” and, finally, the MNCARS stores these data in the section named “Misión”. In relation to the governing body of each of these centres, the website of the MET does not publish the names of the members of this body, unlike the rest of the analysed museums which do share all the names of their board members. Of all the art centres, only the British Museum publishes on its website a small biography for each of these people, and specifies their position within the governing body, just like the MNCARS. However, none of the museums describes the responsibilities of these people within the committees of which they are part. With respect to the meetings of these governing, only the British Museum and the Louvre publish the minute, agenda and agreements of the meetings. All the analysed museums adhere to a code of good governance. The Louvre has a microsite called “Documents juridiques et marchés publics” which contains all the regulations that govern their daily work. In the case of the MET, it is guided by the specific law of the Museum and a series of policies that can be found in the “Policies and Documents” section. The British Museum, as mentioned, includes a section named “Freedom of Information Publication Scheme”, which presents the different policies and codes that govern its performance based on the “Freedom of Information Act”. And in the case of the MNCARS, this information is available in the “Mission” and “Range of Services”, which contain the 2011 Law that regulates the museum, and their statutes and regulations that ensure best practices in this institution. In relation to the economic information made available in the corporate websites of the organisations under analysis, it is worth noting that all of them publish their budget for the current financial year, as well as their incomes. This type of information is collected, mainly and in the case of the Louvre and British Museums, in the annual reports, which explain in detail the accounts of the museums, differentiating revenues and expenses attached to their annual budgets. On the one hand, the MET offers annual reports of expenses, differentiated from its annual report, as well as the “Internal Revenue Service (IRS) Form 990”, a specific document requested by the USA Treasury Department that must be complied with. On the other hand, MNCARS offers the explanation of its financial information not only in its annual reports, but also, as explained in the theoretical framework of this research, since it is a public institution it must publish this information in the Transparency Website of the Spanish Government. It is noteworthy that only the MET published a full report of accounts signed by an external auditor, which increases the objectivity of the data reflected in the financial reports. Finally, all of the analysed centres make reference in their annual reports to the fulfilment of the objectives set out for that time period, specifying the extent of compliance with the general and particular budgets within the institutions. However, these annual reports that assesses the results obtained by the museum do not mention in any case the number of visitors received in the year reported. These data are not available in the reports, but are available on their institutional websites, in the form of press releases distributed by the communications departments of these organisations. In addition, in most cases, the reports offer a comparison between the results of the previous and the current year, with particular emphasis on whether the number of visitors has increased or decreased. However, they do not offer a more detailed analysis of the monthly visitor numbers, despite all of them, in addition to the physical visits, also count the number of followers in the different social networks in which the museums have public profiles. After the analysis of the twenty-four items selected by this work, the percentage of transparency in the analysed museums exceeds 70%, being the British Museum (83%) the institution that meets the largest number of requirements related to transparency, followed by the Spanish Museum MNCARS (80%) and, in last place and sharing position, the Louvre Museum and the MET (71%). Source: Authors’ own creation based on the transparency variables proposed by the Commitment and Transparency Foundation in its report on transparency in the websites of Spanish museums. After presenting all the results of the research study, it is important to offer a series of conclusions that respond to the hypotheses and objectives. The main hypothesis proposed by this research was confirmed because the museums do have begun to use their websites to improve transparency and publish relevant information related to their activities. Based on the data presented in this work and the analysed items, we perceived that these organisations are interested in making visible not only their corporate principles, but also the information relating to their organisational structure, management bodies, regulatory frameworks that guide their work, their good practices and the state and distribution of their budgets. As it occurs with other types of institutions such as, for example, public administrations, which have been the protagonists of many scientific publications related to transparency, museums have also adapted to this new complexity. This research study confirms a good use of corporate websites by museums as tools to demonstrate transparency. However, there is still room for improvement. While the trend is good, some data are still not shared with the public. It is striking that the composition of the governing organs remains, in some cases, a mystery, as well as the identity and curriculum of the members of these bodies, as well as the responsibilities of each of them. Economic data, despite being published, still do not have the endorsement of an independent agency that certifies accuracy and objectivity of this information, which tends to be considered sensitive. The endorsement of external auditor would have a positive effect on the credibility of the museums. The websites of the museums neither have sections that share the global numbers of visitors, or their monthly distribution, which is surprising given that these institutions do not hesitate to make public this information in specialised publications, like the one taken as reference to select the sample of this study. Finally, it is interesting to find that not all of the cases under analysis publish the minutes of the board meetings, nor the topics discussed and the decisions taken in these meetings, which would provide greater clarity about the decision-making processes that take place in these meetings. An objective fact is that of the analysed museums, only the British Museum has a section on its website, “Government transparency agenda”, which refers explicitly to the word transparency and clearly reflects its interest in being perceived as a transparent institution by its public. Here it is important to note that other museums that are not part of the sample for failing to comply with the selection criteria, like the Thyssen-Bornemisza Museum of Madrid, do have a specific section for this purpose. In the case of this art gallery, its website section is named “Transparency Portal” . Of the sample of museums’ corporate websites, despite having relevant information that makes them transparent for the public, the truth is that it is not enough to meet the twenty-four transparency items. Some of these items are not met and most of the information directly related to the transparency indexes are distributed across different sections within the website. Therefore, none of the analysed museums collects all the data analysed into one single section within its website architecture. Thus, users have to find the different items manually or, occasionally, by using the websites’ own search engines. 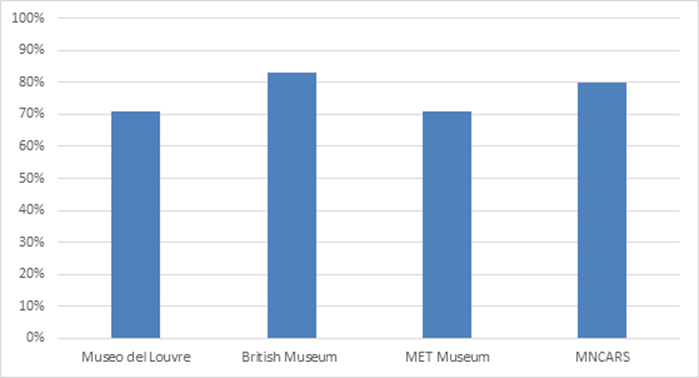 Of the 24 items analysed in this research, which are related the transparency index, all museums exceed 70% of compliance. However, if we correlate the percentage of transparency and the number of visitors registered over the years, the MNCARS obtains a better result as it increases its general volume of visitors, especially in the year 2016. This finding raises a future line of research focused on the relationship that exists between good transparency indexes and the number of visitors to such organisations. It is relevant to research whether, given the characteristics of this type of institution, museums’ self-presentation as transparent organisations is enough to achieve good results in the number of people who enjoy their services. Other elements also seem to influence this factor, such as the appeal of the exhibition offer, the museum’s own services, and the institution’s communication of their daily work. It is clear that museums, as any other type of organisation at the service of society, as stated in their definition, are dynamic institutions that are perceptive of society and have understood the need to adapt to the changes promoted by a new complex landscape that they must face. Through different communication tools, as in the analysed cases, their corporate websites, are approaching their stakeholders by providing them with relevant and interesting information. In this way, they show that they are institutions that, like the government organisations, are committed to transparency and understand it as a need to rebuild society’s trust in them. This work has been funded by UNIR Research (http://research.unir.net), the International University of La Rioja (UNIR, http://www.unir.net), as part of its Institutional Research, Development and Innovation Plan [2015-2017], and the Communication and Digital Society (COYSODI) research group. The transparency website can be accessed at the following URL: http://transparencia.gob.es/ (accessed on 28/5/2017). The most recent definition of museum offered by the International Council of Museums (ICOM) can be found at the following URL: http://icom.museum/la-vision/definicion-del-museo/L/1/ (accessed on 28/05/2017). The Visitor Figures and Attendance Numbers report, developed by The Art Newspaper, are available at the following URL: http://theartnewspaper.com/reports/ (accessed on 28/05/017). The reports produced by the Fundación Compromiso y Transparenciaare available at the following URL: http://www.compromisoytransparencia.com/conocimientos/informes/ (accessed on 28/05/2017). The Transparency website of the Thyssen-Bornemisza Museum of Madrid is available at the following URL: http://transparencia.museothyssen.org/ (accessed on 28/05/2017). M. Arenilla, J.C. Redondo (2011): “Ética, transparencia y participación”. In M. Arenilla (Dir.). Crisis y reforma de la administración pública. Oleiros: Netbiblo. L. Arias-Serrano (2015): “New Museological Approaches in Contemporary Art Museums: From the First Critiques of the Museum in the Early Twentieth Century to Today’s Micronarratives”. Complutum. Vol. 26, n. 2, pp. 133-143. A. Alloza, (2011): “La emergencia de la economía de la reputación corporativa”. Revista Uno, 5, pp. 1-7. P. Beltrán-Orenes, Pilar; E. Martínez-Pastor (2016): “Grado de cumplimiento de las leyes de transparencia, acceso y buen gobierno, y de reutilización de los datos de contratación de la Administración central española”. El profesional de la información, v. 25, n.4, pp. 557-567. G. Black (2012): Transforming Museums in the Twenty-First Century. London and New York: Routledge. F. Cabezuelo-Lorenzo, P. Rey-García, A. Tapia-Frade (2016): “Análisis de las herramientas de control ciudadano sobre los representantes públicos: La transparencia informativa municipal en Castilla y León”. Revista Latina de Comunicación Social, 71, pp. 1.261-1279. M. C. Carey (2017): “Transparency and the lobbying efforts of newspaper associations in the United States”. Journalism Studies. Vol. 18, n. 4, pp. 409-429. I. Castelló, M. Morsing & F. Schultz (2013): “Communicative Dynamics and the Polyphony of Corporate Social Responsibility in the Network Society”. Journal of Business Ethics, 118(4), pp. 683-694. D. Cordón-Benito, D. González-González (2016): “Museos y comunicación: los nuevos medios como herramienta de diálogo y sociabilidad de la institución. El uso de Twitter por el Museo del Prado, Museo Thyssen-Bornemisza y Museo Reina Sofía”. Fonseca Journal of Communication. Vol. 1, nº12, pp. 149-165. J. Cornelissen (2004): Corporate Communication: A Guide to Theory and Practice. California-Londres: SAGE. A. Cortina, (Ed.) (2003): Construir confianza: ética de la empresa en la sociedad de la información y las comunicaciones. Madrid: Editorial Trotta. C. Craig, P. Ngondo, M.A. Flynn (2016): “How firm is your digital handshake? Mission statements and transparency”. Public Relations Review, Vol. 42, n. 4, pp. 692-694. B. De la Iglesia, M.R. Roselló-Ramón (2014): “Identificación de las barreras de acceso a la información, a la participación y al aprendizaje en el Museo Es Baluard”. Arte, Individuo y Sociedad, Vol. 26, n º1, p. 21-38. Conceptualizations”. Public Relations Review, 31(4), 527-533. R. E. Freeman (1984): Strategic management: a stakeholder approach. Boston: Pitman. R. E. Freeman, J. S. Harrison, A. C. Mechas, B. L. Parmar & S. De Colle. (2010): Stakeholder theory: the state of the art. Cambridge: Cambridge University Press. M. Gértrudix, M.C. Gertrudis-Casado, S. Álvarez-García (2016): “Consumption of public institutions. Open Data by Spanish citizens”. El profesional de la información, v. 25, n.4, pp. 535-544. E. Gutiérrez; M.T. Laporte (Eds.) (2013): Tendencias emergentes en la comunicación de instituciones. Barcelona: UOC Press. E. Hooper-Greenhill, (1989): “The museum in the disciplinary society”, in S. Pearce (Ed.). Museum Studies in Material Culture, pp. 61-72. London: Leicester University Press. E. Hooper-Greenhill (1992): Museums and the Shaping of Knowledge. London: Routledge. E. Hooper-Greenhill (2000): Museums and the Interpretation of Visual Culture. London: Routledge. T. Bennett (1996): The Birth of the Museum, London: Routledge. N.C. Huang-Horowitz (2015): “Public relations in the small business environment: creating identity and building reputation”. Public Relations Review. Vol. 41, n. 3, pp. 345-353. M. Karlsson, C. Clerwall, L. Nord (2017): “Do not stand corrected: Transparency and users” attitudes to inaccurate news and corrections in online journalism”. Journalism & Mass Communication Quarterly, Vol. 94, n. 1, pp. 148-167. M. Lizcano (2013): “La nueva Ley de Transparencia: un importante desafío social”. Abogacía.es. España. L. La-Rosa, T. Sandoval-Martín (2016): “La insuficiencia de la Ley de Transparencia para el ejercicio del periodismo de datos en España”. Revista Latina de Comunicación Social, 71, pp. 1.208-1.229. P. C. López-López, I. Puentes- Rivera & J. Rúas-Araujo (2017): “Transparency in public televisions: development of indicators and case analysis in Spain and Chile”. Revista Latina de Comunicación Social, Vol. 72, n.3, pp. 253-272. R. Magallón (2013): “Por qué es importante una buena Ley de Transparencia para el periodismo y para los periodistas”. Instituto para la Innovación Periodística. España. M. Rebolledo, R. Zamora-Medina, J. Rodríguez-Virgili (2016): “Transparency, accountability and participation in local governments: a comparative study of Spanish council Websites”. Medijske Studije-Media Studies, Vol. 7, n.14, pp. 48-64. A. G. Scherer, G. Palazzo & D. Matten (2014): “The Business Firm as a Political Actor: A New Theory of the Firm for a Globalized World”. Business & Society, 538(2), pp. 143-156. K. Sriramesh, (2010): “Globalization and Public Relations. Opportunities for Growth and Reformulation”. In R. Heath (Ed). The SAGE Handbook of Public Relations, pp. 691-707. California-London: SAGE. JC Suárez-Villegas, R. Rodríguez-Martínez, M. Mauri-Ríos, A. López-Meri (2017): “Accountability and Media Systems in Spain: real impact and good practices in Spanish media”. Revista Latina de Comunicación Social. Vol. 72, n. 3, pp. 321-330. J. Villafañe (2004): La buena reputación: claves del valor intangible de las empresas. Madrid: Pirámide. J. Villafañe (2013): La buena empresa: propuesta para una teoría de la reputación corporativa. Madrid: Pearson. S.W. Yoo, H. Gil de Zúñiga (2014): “Connecting blog, twitter and Facebook use with gaps in knowledge and participation. Communication & Society, Vol. 27, n. 4, pp. 33-48. Internal Revenue Service (IRS) Form 900 (USA). Article received on 2 July 2017. Accepted on 18 August. Published on 23 August 2017.